A team of scientists from I.M. Sechenov First Moscow State Medical University (MSMU) together with their colleagues isolated a peptide named emericellipsin A from soil fungi. The substance was proved to possess antitumor and antibacterial properties. The report of the scientists was published in the Molecules journal. Soil fungi have long been known as an excellent source of antibacterial substances. Penicillins and cephalosporins produced by micellar (mouldy) fungi are the most well-known ones. These types of fungi are well-studied and have been used for a long time, that gave bacterias resistance to the majority of their antibiotics. Therefore, scientists have to constantly modify the molecules of antibiotics to efficiently destroy harmful bacteria. A team of researchers from MSMU discovered a completely new antibacterial and antitumor substance from an alkalophilic strain of Emericellopsis alkalina—an organism living in the alkaline environment that is harmful for others. These fungi have to adapt to the high salinity of the environment and scarcity of nutrients by creating new biologically active compounds. 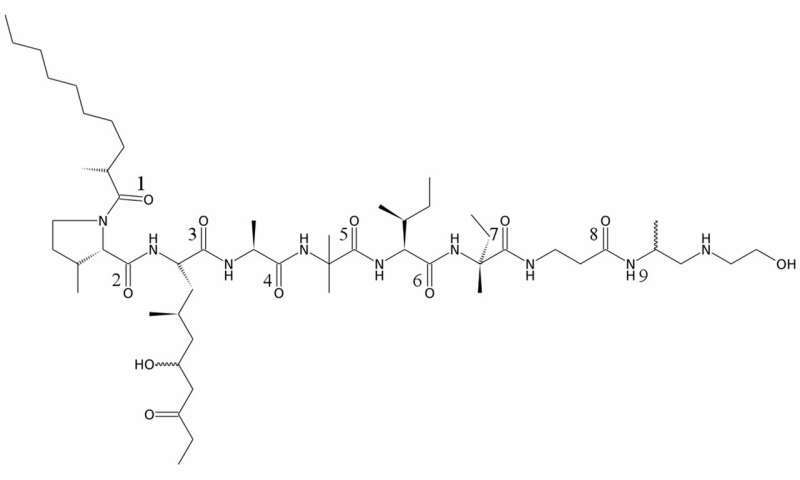 New molecule belongs to the class of peptaibols. It is a small peptide consisting of nine amino acid resudues including unusual ones that are not coded in a DNA sequence. To study the structure of the compound, the scientists used nuclear magnetic resonance—a method based on changes in the characteristics of atoms depending on connection between them. The peptaibol was named emericellipsin A according the genus name of producing fungi. Studies showed that the protein had high antifungal activity against the Candida albicans yeast and the Aspergillus niger mould. Also, it was able to kill several kinds of bacteria as well. Moreover, scientists identified some antitumor properties of emericellipsin A and suggested it worked by damaging the membranes of tumor cells. "The peptaibol emericellipsin A is shorter than the majority of other known molecules of this class and therefore is more appropriate for drug development. Despite the lack of bactericide effect against gram-negative bacteria, the peptaibol suppresses their ability to form biofilms. The peptaibol's high antifungal activity against Candida and Aspergillus fungi reflects its potential as a new antifungal drug. It may also be active against the fungi resistant to other medicinal drugs. Our results open new perspectives for further studies of emericellipsin A and its analogs," said Yaroslav Andreev, a co-author of the work, the head of the laboratory of molecular and cellular biology of MSMU.